Podolinsky's style is not at all didactic or 'lecture hall' instruction. With attractive personal style, he taught me the difference between stating a wish or dream, and WRITING clear goals -- goals that I'll use to measure my progress and build my successes. I'm squirming because of his insistence that I include rewards and punishments as one way of keeping myself motivated. But even I - a person raised in a guilt-powered family - can embrace discipline the way Podolinsky outlines it. In our company, we've already employed his lessons, and they've been warmly received and acted upon. I'm receiving reports of "hey, this works!" and "you mean I'm allowed to schedule a life for myself?!" 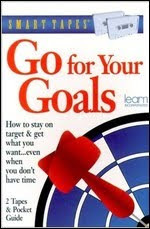 [Yes, folks, finding a balance between personal and professional goals is a whole chapter in this tiny book.] What a gem "Go for Your Goals" turned out to be! K.L. Eckhardt, President, CommWare Technologies, Inc.